ALL IN THE FAMILY – Walter Wallingham, pictured in recent competition, will lead the Yukon into the Canadian Senior Curling Championships in Edmonton next month. 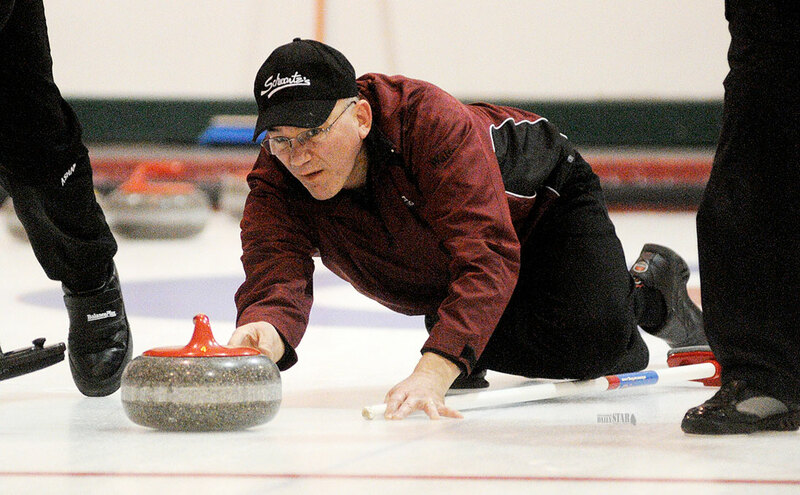 After watching his children compete in a string of recent national curling championships, Walter Wallingham is heading back to the big stage himself. His latest foray into the senior nationals comes with an assist by Ray Mikkelsen. With Wallingham in Cornerbrook, Nfld., to watch his son, Joe Wallingham, compete at last week’s junior nationals, Mikkelsen stepped into his skip shoes and sealed the title. Wallingham’s rink beat out defending champion George Hilderman last weekend in a best-of-three series. After dropping the opener 7-3, the team came back to win two extra-end games by scores of 5-4 and 6-5. Masters Curling Championship in Whitehorse next month. Ironically, Zealand, who played third for Team Wallingham at the senior playdowns, will serve as Hilderman’s third at the masters event. Hilderman’s senior teammates were Doug Gee (third), Doug Hamilton (second) and Dale Enzenauer (lead). Wallingham said he knew he’d have to call upon Mikkelsen as a spare for the local playdowns, as he wanted to watch his son compete at juniors. Wallingham and his rink compete in the Thursday Night League at the Whitehorse club. The 2015 Canadian Senior Curling Championships will be held at the Thistle Curling Club in Edmonton March 21 to 28. The event won’t be Wallingham’s first national appearance. He competed at junior nationals in 1978 and served as a spare for Mikkelsen at the senior nationals in 2013. His goals for the upcoming senior event is to do the best he can. “I really don’t like speculating, but we’ll go down and hopefully curl decently and provide competition for the teams down south,” he said. Wallingham’s son Joe has competed in the last three junior curling nationals, while his daughter, Patty Wallingham, is readying for her second straight Scotties appearance with Team Koltun. – – – In other Whitehorse Curling Club news, the two rinks heading to the Pacific International Cup event have been announced. The men’s team was acclaimed and will include skip Tyler Williams, third Scott Williamson, second Richard Weihers and lead Bob Walker. On the women’s side, Laura Eby’s rink bested Jody Smallwood in a three-game series. Eby will be joined by teammates Lorna Spenner (third), Janine Peters (second) and Deb Enoch (lead) at the April tournament in Richmond, B.C. This weekend, the Whitehorse club will host the Mixed Doubles Championships, with Team Balsam squaring off with Team Smallwood in a best-of-three series. Bob and Jody Smallwood will battle with Balsam and teammate Corrine Delaire for the chance to attend the national event in Ottawa.